The holidays are a wonderful time for some kids. Bright lights, Christmas music, parades, parties, and visits with Santa can all be the stuff of happy childhood memories. For children with special needs and their parents, though, events that feature loud noise, big crowds, and bright lights can be overwhelming. Even more difficult can be others' judgments of a child who just doesn't behave in expected ways. The rolled eyes when a child can't respond instantly to a question "what do you want Santa to bring you?" The whispers when a child melts down, especially when he's "old enough to behave." It can be tempting to disappear into your own home with your special needs child and shut the world out. Sometimes, depending on your child and your situation, that's not a bad choice. But there really are some great ways for families with special needs children to enjoy the holidays without pain. Here are some top suggestions for making the season bright! Instead of parades and big town-wide Christmas light events, consider taking a car drive to see some of the best local light displays. Some areas even offer large-scale drive-through light displays. You can enjoy the wonders of the beautiful lights without the cold, noise, or crowds! Visit special holiday displays at off hours. Look at holiday windows when shops are closed, or stop in at decorated museums or shops first thing in the morning when no one else is up yet. Instead of going to the mall to visit Santa, invite "Santa" to visit your home for a personal chat. Rather than visiting the crowded Christmas Market in a city, stop in at your local nursery where pretty holiday greens and lights create a miniature wonderland. Check the paper and Google for Sensory Friendly Santas, shops, movies, and more. Many communities are creating experiences specifically geared to the needs of kids and adults who are easily overwhelmed. Stay home and bake cookies, make paper garlands, cut snowflakes, or otherwise have crafty fun with your child. If you need to do most of the work, that's ok! Instead of attending a professional musical or dance event with your child, consider smaller, local performances or concerts that are less formal, less expensive, and shorter. Even if your child starts to melt down in the middle and you need to leave, you'll know your child had at least a taste of a classic holiday experience. 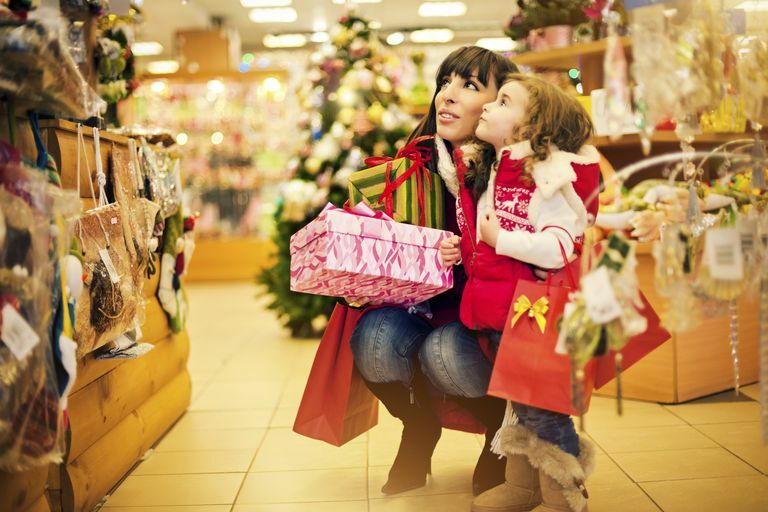 Plan on short, simple shopping trips that make sense to your child. Rather than trying to do it all at once, take your child shopping for just one or two special gifts for friends or family members. Encourage your child to select a particular gift for a loved one so she can have the experience of watching them open it! When planning your actual Christmas Day, think about your child's needs before making any commitments. If your child can handle a couple of hours (but not a whole day) of family togetherness, decide ahead of time which hours are really important. Let your extended family know your plan, and stick to it. If you generally attend religious services on Christmas, consider sitting near the back of the sanctuary so you have an easy "escape route." If the length of the service becomes too much for your child, you can beat an easy retreat. Let your child decorate cookies no matter what the decorations look like. Watch The Muppets Christmas Carol instead of the longer, scarier versions of the story. Wrap up a few presents that you child will love, no matter what the age on the box. Remember that the holidays aren't for garnering praise or appreciation; they're for building relationships and memories (and, for many people, for remembering the religious significance of Christmas). If you're able to remember even a few special moments when the holidays are done, you've succeeded! Try to find ways to connect with your child at his level or around his interests. Could you possibly find a way to drum up interest in the things that fascinate him, even for half an hour? You might be surprised at the positive results you get! Give yourself permission to walk away from difficult situations. While some extended families and friends can be wonderful with special needs kids, others...aren't. If your family falls into that second group, it's ok to pack it up early and just go home. You're under no obligation to stick with an unpleasant situation. Get support if you need it. Maybe you really need to attend a carol sing, a church service, or a special party even if your child can't or won't. There's nothing wrong with asking for a little respite care from friends or family so that you can have the experience you need to recharge and remember why the holidays are special! For many people, the holidays are stressful with or without children with special needs. But the holidays are actually the perfect time of year to take a step back, notice what's gone well over the course of the last year, and celebrate small victories. It's also a great time of year to spend with people you love. If that means a few less cookies baked or a few less cards sent, it's a small price to pay to connect (or reconnect) with what makes your child uniquely wonderful!